Nearly two weeks ago I made a greek yogurt panna cotta for a brunch dessert. Since then, I have done some cooking with lavender and lemons. Looking in my refrigerator, I saw that there was some yogurt left as well as some more lemons on the counter and plenty of lavender, so I decided to revisit the panna cotta but this time with lavender and lemon as the flavoring. 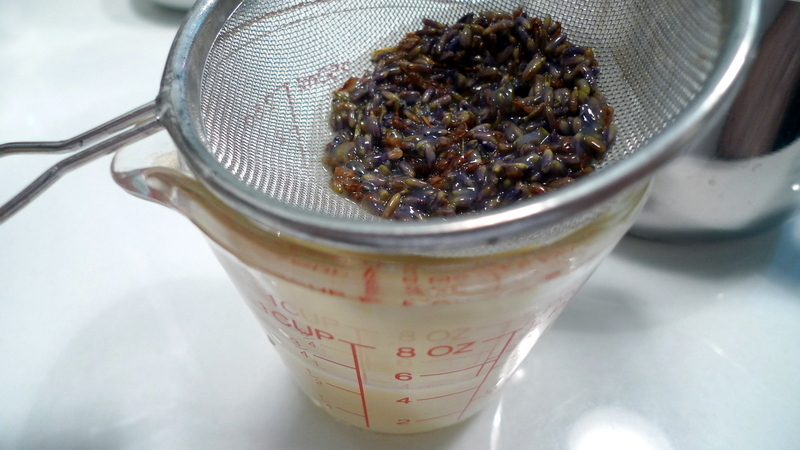 I added lavender to the cream and sugar mixture, brought it to a near-boil, and then let the lavender steep for two hours off the heat. Afterwards, I strained the flowers and reheated the cream. Taking it off the heat again, I dissolved some hydrated gelatine into it, then whisked the yogurt in. 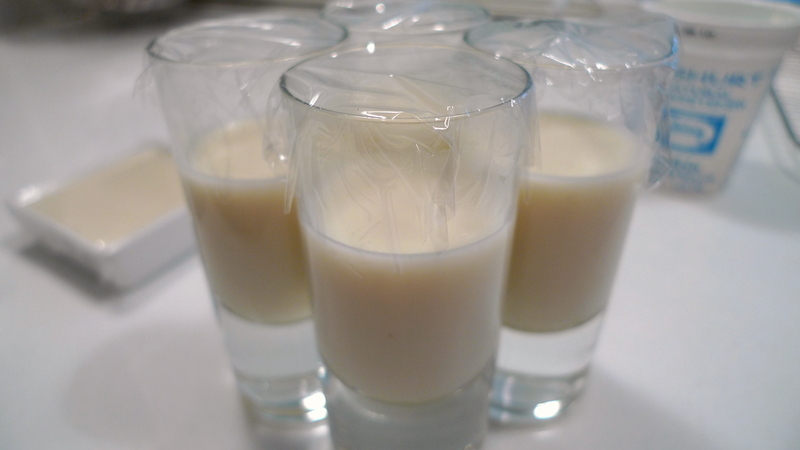 For fun, in addition to putting it in ramekins that could be unmolded onto a plate, I poured some of the mixture into shot glasses. These were put in the refrigerator overnight to set. 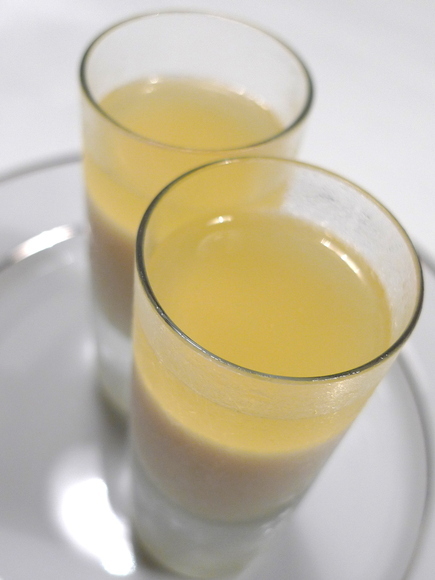 The next day, I made another mixture with lemon juice, sugar, and gelatine. This was poured on top of the panna cotta and allowed to set for a few hours. Upon eating it, you had a sweet-tart lemony jelly on top of the lavender panna cotta. Quite nice and it makes for interesting presentation. A garnish of mint would have been nice, too, but I didn’t have any. This entry was posted in Uncategorized and tagged cooking, dessert, food, Lavender, lemon, panna cotta by christao408. Bookmark the permalink. Lavender! Now that is a new one on me ! Your fridge and counters are spotless! My gawd… when I cook, everything flies all over the place. I’m going to try the lavender bubble tea next time. This looked very good but I’m curious about how lavender tastes. Does it taste like it smells? Oooo Eemmmm Geeee!!!! (droooling) Wish there is a “LIKE” feature here… I’ll like this post and Andy’s comment!! !Can you mail me some?!?! You are so talented~! !I HEART LAVENDER and I LOVE LEMON… what an interesting combination (trying to picture it in my head…. ::droool::)Have you tried Lavender MilkTea?! Also very YUMMMMM!!!! @murisopsis – The lavender I’m using (possibly due to age?) has a slightly more astringent flavor than the typical lavender smell. “Astringent” may be too strong a word. When we ate just the panna cotta without the lemon jelly on top, I almost thought there were hints of ginger, although I know for certain there were not any. @ElusiveWords – No picture of my fridge there so you won’t see how dirty it could be. As for the counters, I try to wipe them down before shooting. @Sinful_Sundae – I also did lavender and lemon scones, which I’ll post about in the next few days. @yang1815 – @Chatamanda – Lavender is lovely and I wish I would use it more often. I kind of forget it is sitting in the cupboard. I want to do a lavender creme brulee with it. @CurryPuffy – I agree, very refreshing and rich but without the egginess. TOO COOL!!! Please also make lavender creme brulee so I can read all about it Cheers! I think the layers of taste are excellent and I added the mint. You have some great recipes! @Wangium – Interesting, why almond tofu? Just cause of the similar look? @Sinful_Sundae – Will put that on my “need to get to” list. @Fatcat723 – Mint would be really nice. @Dezinerdreams – Come visit! =D@LostSock21 – Glad you think so. @christao408 – That sounds fantastic! @Wangium – I’m curious about it. Can you make it at home? What’s involved in making it? @christao408 – yay!!! sounds awesome-o. really loooking fwd to it! You are amazing Chris. Is there no end to your culinary skills? I have never had anything made with lavender. I think I would like that… I grow a lot of it along with the herbs, and would love to try something simple, using the flowers. Do you use the leaves any? @Wangium – Oh, so it isn’t actually tofu? @ZSA_MD – I don’t think you use the leaves, just the flowers. But very important that it must not have had any pesticides used on it. Also may need to confirm that the type you grow is edible – I think there are different types of lavender.